Azul Beach Resort Negril Hotel located on the world-famous Seven Mile Beach of Negril which lines the west coast of the island. Featuring the renowned Karisma Gourmet Inclusive® Experience, the 136 Ocean View roomsAzul Beach Resort Negril brings together spacious facilities with unlimited activities and services. 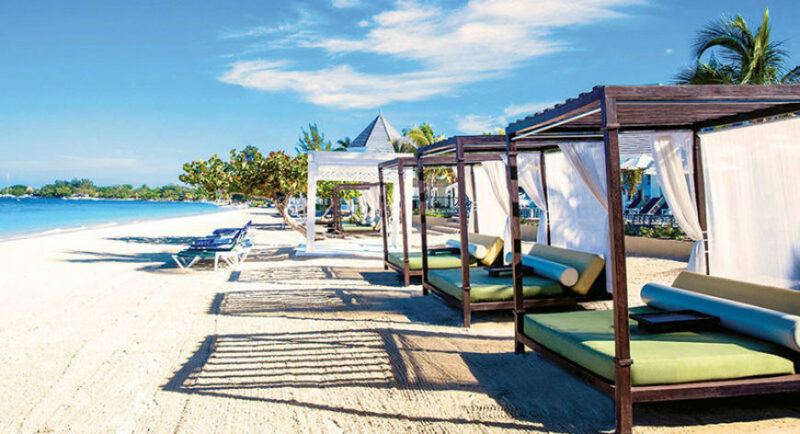 Azul Beach Resort Negril is a contemporary resort with a laid-back Caribbean feel designed to allow couples, groups, wedding parties, families and friends from all generations to reconnect under the sun. The highlights of the hotel include the Amber pool area accessorized by world-renowned British fashion designer Jonathan Saunders, and an adults-only section, with romantic Honeymoon Suites and a Swim Up Bar and Lounge. The property also features a separate area with suites for families that can accommodate up to 2 Adults and 3 Children. 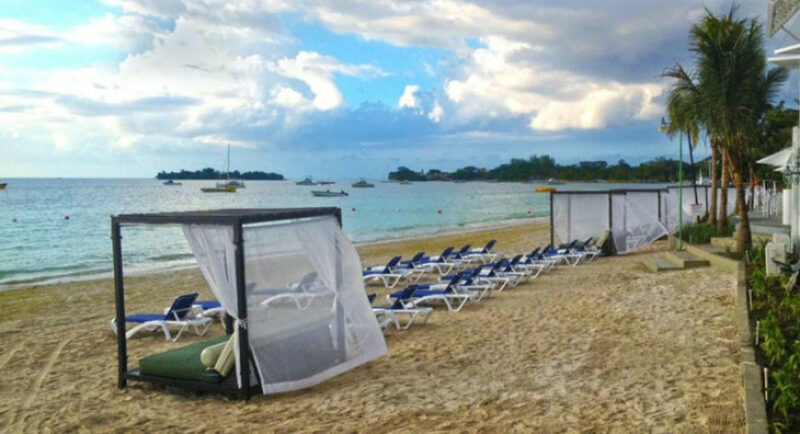 Situated on Negril’s world-famous Seven Mile Beach, Azul Sensatori Jamaica enjoys an enviable Caribbean location. The closest airport is in Montego Bay, an hour and fifteen minutes’ drive from Negril. All suites are provided with air conditioning, 42” plasma TV, Blu-ray player, iPod docking station, either king bed, two doubles or one king + sofa bed, laptop-size digital safe, amenity kit, minibar stocked once a day, iron and ironing board, coffee maker, balcony or terrace featuring round daybeds with canopy, direct dialing telephone, deluxe bathrobes, bathrooms with rain forest showerhead, hairdryer and vanity mirror. Guests can select from a variety of pillows provided for complete rest and relaxation. 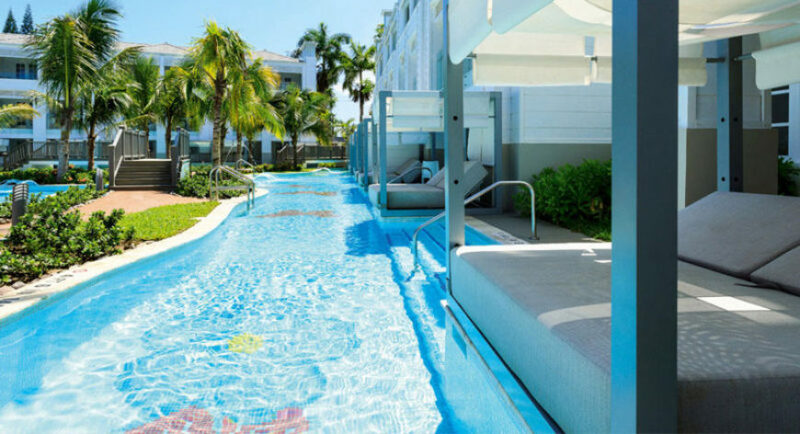 All Swim up Suite exteriors feature king size Bali beds with direct pool access and retractable curtains for the ultimate sun bathing experience. Oversized suites, with premium amenities including aromatherapy menu. These suites feature a wraparound balcony, king size bed, separate sitting area and bathroom with his and hers sinks. Located in both the adults section and the multigenerational sections, directly in front of the beach. Oversized suites with premium amenities including aromatherapy menu. These suites feature a wraparound balcony, a king size bed, separate sitting area and bathroom with his and hers sinks. Located in both the adults and multigenerational sections, directly in front of the beach. Guests can step right into a lazy river which crosses in front of the suite and connects to the section’s Swim Up Bar. Cozy and well-appointed, this room features picture window views of the Caribbean Sea. Located in both adults & multigenerational sections. Guests can step right into a lazy river which crosses in front of these suites. Cozy and well-appointed, these rooms feature commanding views of the Caribbean Sea. Located in both adults and multigenerational sections. Multigenerational section The 82 luxurious rooms & suites are tastefully designed in contemporary Caribbean style and feature either two double beds or one king size bed. They are located in four sections. 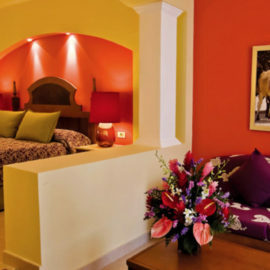 Accommodations in these sections feature views of the Seven Mile Beach and Caribbean Sea. Specially designed for families, with a private king size bed master bedroom, separate living room area with a sofa bed designed to accommodate 2 children. Ocean View with balcony or terrace. Two story suites with two bedrooms, specially designed for families. One bedroom features a king bed (lower floor) and the other features two double beds, each with private bathrooms, on separate floors. The lower floor also features an Ocean View balcony, separate living area, TV and Blu-ray and a sofa bed designed to accommodate 2 children. Max Occupancy: 4 adults + 2 children or 2 adults + 6 children or 3 adults + 4 children. These suites have a master bedroom featuring a queen size bed with TV and separate bathroom. The living room features a sitting area with TV and Blu-ray. These suites have two bedrooms each with TV, one featuring a king size bed and the other with two twin beds. The living room features a sitting area with TV, Blu-ray and sofa bed. Oversize suites with premium amenities such as pillow and aromatherapy menu. These suites feature a king size bed, separate sitting area and bathroom with his and hers sinks. Located in multigenerational section directly in front of the beach. Conquer the art of eating well at the four Karisma Gourmet Inclusive® Experience restaurants and two Corners offering worldly cuisine served à la carte or presented on food displays to delight every palate. Our dress code is “Casual Elegant” please no tank- tops, shorts, bermudas, tennis shoes or beach sandals of any kind. 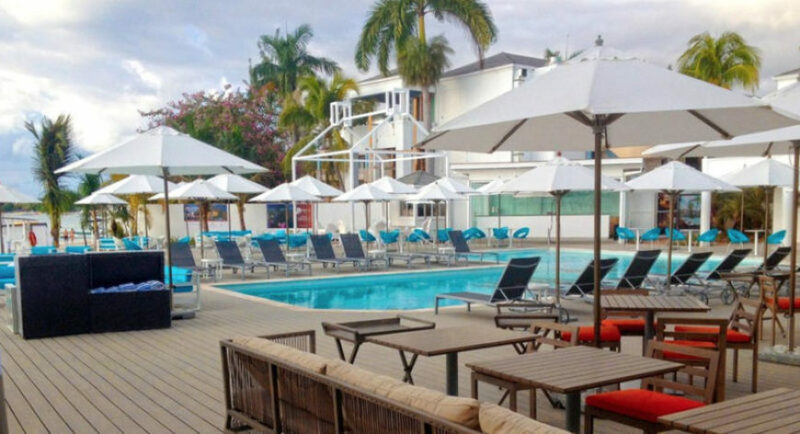 Located directly on the beach in Garfield’s Restaurant in the multigenerational section serving mouthwatering cocktails and creative nonalcoholic refreshments, international and domestic premium brands, this bar has spectacular views of the Caribbean Sea. Featuring widest selection of Rums and a premium cocktail menu, Rasta Lounge has many options to choose from. Nightly live music. Located in the multigenerational section. Serving mouthwatering frozen cocktails, international and domestic premium brands, this bar has spectacular view of the Caribbean Sea. 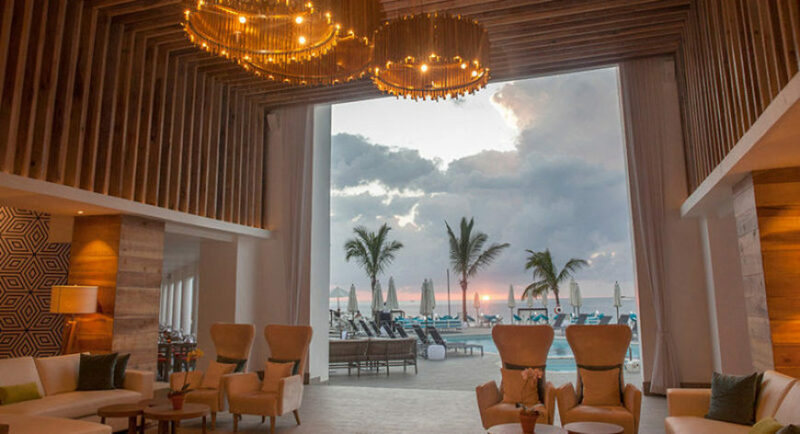 Sky massage: Beachfront elevated massage areas overlooking the Caribbean Sea. (Available as of May 1st 2014. Provisional Workout Facility currently available) The fitness facility offers the latest in weight training systems and cardio equipment.